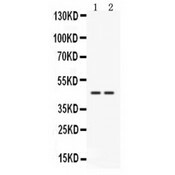 Cathepsin K antibody LS-C408068 is an unconjugated rabbit polyclonal antibody to human Cathepsin K (CTSK). Validated for IHC and WB. 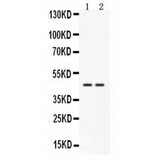 E. coli-derived human Cathepsin K recombinant protein (Position: A115-M329). Human Cathepsin K shares 86.9% and 88.8% amino acid (aa) sequence identity with mouse and rat Cathepsin K, respectively. Predominantly expressed in osteoclasts (bones). Reconstitute with 200 µl of distilled water. 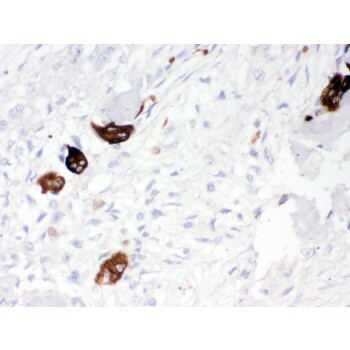 Cathepsin K was detected in paraffin-embedded sections of human osteosarcoma tissues using rabbit anti- Cathepsin K Antigen Affinity purified polyclonal antibody at 1 ug/mL. The immunohistochemical section was developed using SABC method. Western blot analysis of Cathepsin K expression in HELA whole cell lysates (lane 1) and 22RV1 whole cell lysates (lane 2). 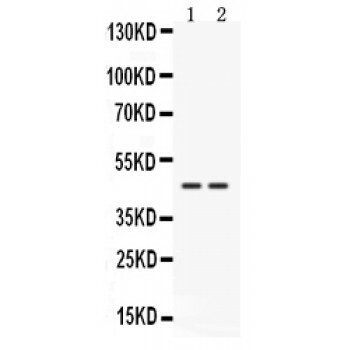 Cathepsin K at 45 kD was detected using rabbit anti- Cathepsin K Antigen Affinity purified polyclonal antibody at 0.5 ug/mL. 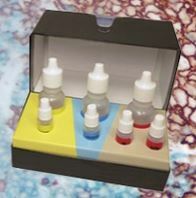 The blot was developed using chemiluminescence (ECL) method.